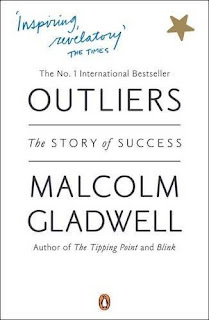 I have just finished reading Malcolm Gladwell's, book - 'Outliers' - well worth a read. The central aim of the book is to disprove the 'myth' of the 'self-made man or woman' or in other words, the idea that 'genius' individuals succeed without educational, parental, environmental or cultural advantage having being bestowed on them. Rather, it illustrates that the benefits of these things is critical. It achieves the aim very comprehensively and explodes a lot of other myths along the way. The first chapter explains how, quite recently, it was noticed that the month of birth of top level Canadian ice-hockey players was not spread across the whole year but was heavily weighted to the early months of the year. Most players were born between Jan and April! This caused some consternation until the reason was uncovered. The assumption had been that Canadian ice-hockey was entirely meritorious - with players competing with each other throughout their school and playing careers and thus the most talented emerged over time. So surely the talent should be distributed reasonably evenly across people born in all parts of the year? The answer all came down to 'selection'. Typically kids would first be selected for hockey teams at the age of 9 or 10. The cut off date for the class was Jan 1st - so the older kids were more likely to be physically developed than the younger kids with birthdays from say October to December. So the older ones would get selected at this early age and all the effort and development would consequently be invested in them - so although all kids would play hockey throughout school, those kids who had been selected early would get more practice, more expert coaching, more encouragement! etc - so would have a big advantage...obvious really! Apparently there is a similar situation with English Premiership footballers – for exactly the same reason. What is the Bigger Impact of this? Does the same thing happen in all kinds of education? A small child goes to school – his first class in a new year. His class is asked to ‘write a story’. Our child’s mother told her child a story the previous night – a good story. So, the child writes this story while maybe changing a few bits along the way. The child gets top marks, they are told how ‘clever’ they are (or how relatively stupid some of the other kids are whose mothers didn’t happen, or weren’t able to read them a story!) and attention and effort is put into developing this ‘natural talent’ and of course, over-time it works.. Nature vs Nurture – What do you believe? How many teachers (Nature leaning types) believe that their job is to find naturally gifted kids and nurture their natural talent? – in other words isolate some kids and lavish more attention, effort, resource and encouragement on them than on the rest. And how many teachers (Nurture leaning types) think it is their job to teach all the kids in the classroom and give every one of them the set of tools required to go out into the adult world? Nature vs Nurture is a big question. I contend that it is very unhealthy for professional educators to adopt a belief that Nature is the overwhelming force. Why? Because this conscious, or unconscious, belief informs their attitude and behaviour towards apparently less ‘gifted’ kids – which means that they lavish their attention and effort on these kids so the others get short-changed. If you are going to make educational opportunity equal then you have to make sure that those delivering the education are not going to make arbitrary, groundless, knee-jerk judgements about where to concentrate their efforts. Streaming – The problem or the solution? Take streaming. Are the kids in the ‘top’ maths set given less resource and time to work on a subject – maths for example – than the other kids? Do the kids in the ‘bottom’ set get the more experienced and capable teachers dedicating more time to them than the others? No. Yet the objective for them all is the same. Isn’t it? Yes – absolutely. They all have to sit the same exams at the end of their secondary education. So surely those who arrive at school with less apparent ‘ability’ to do well in a subject should have more time spent on them. Surely streaming should involve kids spending more time on subjects that they have not yet developed ability at, and less time on those that they have – until they all become rounded and develop a far more equal ability. So shouldn’t streaming in fact be about dividing up the school day in such a way that kids spend more time on the subjects on which they ‘need to spend more time’ and less on those where they don’t.. seems obvious. Culture Change – What is the Test? In 10-20 years time will we still in this country hear people being described as ‘clever’ or ‘intelligent’ or instead will, over-time, we hear people being described as ‘knowledgable’ or ‘expert’ instead? I suspect it is this. The idea that all kids innately have a largely equal capacity to absorb knowledge and process information is counter-intuitive to many educators and those involved in forming the education system. Why? Because they themselves perceive themselves to be those exclusive ‘clever’ and ‘intelligent’ people – a belief that has been re-inforced throughout their lives by people telling them how ‘clever’ and ‘intelligent’ they are. So the hurdle is for them to overcome this belief. To ‘buy-in’ to the idea that they were not born superior but simply that they had the family, cultural, environmental and educational inputs which bestowed relative advantage on them. As in all forms of persuasion (achieving change), the key to changing behaviour and attitude is changing the underlying belief. You can attack poor attitudes and bad behaviour but unless you change the underlying belief then you have to resort the big stick, or discipline - force. But really, if you want people to do something just make them want to do it. It’s so, so much easier. How? By changing the underlying belief. This is just as true from the perspective of getting teachers to spend their time and effort in more equitable ways as it is from the perspective of getting kids to put the time and effort into learning a subject – if they believe they are not ‘good at something’ then they will not put in the work. If they believe they can be then they will. Wouldn’t it be fascinating to see if there is any historic relationship between GCSE exam results and birth months? Would you find that kids born in September, October and November get better results than those born in June, July and August? Luckily, Robin and I have come to an understanding that while we disagree on this subject, that is no reason not to debate it. Schooled during the 70's and '80's, I benefitted from time in both the public and private sectors. The major difference in my opinion is that in the latter, all parents have an interest in their kids education, while in the former that just simply isn't the case. And while I agree with the issue that 12 month 'years' at school bestow a disadvantage on the younger kids in the year - kids born in Sep '72 would have had an advantage well into their teens over the kids born in Aug '73 for example - I contend rather that this entire question concerns the ability of teachers, the ability of kids and the ability of parents . I consider that we come to a conclusion where the ideal - utopian if you like - situation is one where each kid has an individual tutor and a parent who supports that tutor within an environment that bestows social skills. Back in real-life land, the closest it has been found that we can get to that is highly motivated teachers, teaching small numbers of kids of similar learning abilities, within a safe but social environment and with good support at home. If we are to reboot the education system, this is what I consider we must be aiming for. It's patronising and unrealistic and just damns a group of people to having no chance - the sort of Conservative attitude which is so damaging. It just sounds elitist and self-serving. Unfortunately you cannot depend on all parents to provide the support and interest in their kids education - a lot of them just don't or will not - so do you just leave them behind? Read the book and you will see that your argument that people are born clever is little more than a simplistic misguided mistake. Should your opportunity in life be an accident of birth? Or do you think that by the time you are born the accident already happened? I don't need to read the book to know that its not patronising or unrealistic to recognise that kids are born different. Are you really suggesting that all kids are the same at birth? And are you suggesting that all kids thereafter be levelled in terms of ability in order to remove natural advantage. Now that would be unrealistic.